Daryl Rosser is a local SEO consultant and founder of the Lion Zeal SEO podcast and 18,000 member community. In this guide, I’m going to show how to get $1,000+ per month SEO clients by sending a few personalized video pitches a day. This is the exact process I used to scale my SEO agency (LionZeal) to thousands of dollars per month in revenue. In this post, I’ll be walking you through how to replicate this process (and my success) step‐by‐step. But first, let me tackle a question I get asked all the time. Why do most people struggle to find $1K/month SEO clients? Not only do I use this process myself; I’ve also taught it to a LOT of people. It has worked for everyone I’ve taught. But sometimes, people are somewhat skeptical in the beginning. I get it…finding $1K+/month SEO clients isn’t easy. Or at least that’s what I thought…then I tried this process and realized how wrong I was. So, what’s so unique about the way I do things? Honestly, nothing. It’s just that I’ve ironed out the creases that exist in almost everyone else’s processes. Not finding the right prospects? (i.e., those with the funds to actually pay you). You fail. Not pitching convincingly? You fail. Not following‐up with non‐repliers? …You get the idea. The truth is, very few people have a process for scaling all the above in an efficient, non‐spammy manner. That’s what’s unique about my process; it allows you to scale every part of the process without spamming 50K+ people. I do believe the leads can be weak. Let’s say your goal is to acquire $1,000+ per month clients, which should be an absolute minimum because, below that, there’s little chance you can provide much value. Can a one‐man plumbing company afford to pay you $1,000 per month? Probably not, especially considering that the average salary for a self‐employed plumber is $55,000 (2014 statistic). This would mean that they’re spending almost 25% of their salary on SEO alone, which isn’t realistic. How about a shop that sells phone covers? I mean, if we assume that the average phone cover sells for $10. And the retailer has a 50% margin. They’d have to sell an extra 200 phone covers per month just to break even on their SEO spend. So who CAN afford your services? And make sure they have decent profit margins, too. There’s no point working with industries that make single‐digit percentage margins on their sales—you’ll struggle to ever generate a ROI for them. This is why Amazon affiliate site owners can rarely afford to pay $1K+/month for SEO. It will never pay off for them. Their margins are in single‐digit percentages, which usually equates to a few pence on most sales. But still, you shouldn’t target everyone in your chosen niche—target the segments that make the most money. Large, well‐established (and often national) plumbing companies. Like I said earlier, one man bands are out of the question. But I’d also stay clear of startups. Most of these don’t yet have a proven business model. And this means they’ll likely blame you for all of their marketing woes. I can’t tell you precisely who to target, but once you’ve got a niche in mind, I highly recommend doing some preliminary research. Which services make these companies the most money? What services do they offer? Are there different names which they use? This is the simplest, yet most time‐consuming part of the process. All you have to think about is where you can find the businesses you’ve chosen to target. The first, most obvious choice is Google. Search for dental implant companies in different cities. Everyone who’s not ranking well is a potential prospect. Enter a keyword related to your target industry into Content Explorer. 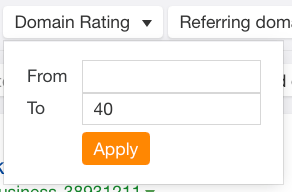 Filter for sites that have a Domain Rating (DR) between 0–10. This will drastically reduce the number of potential prospects. Then, run them through Ahrefs’ Batch Analysis tool (200 at a time) to see how much traffic they get. And there you have it, a list of relevant websites with metrics. All you have to do it go through the list manually and cherry‐pick the best prospects. How about Adwords? If they’re spending money on Adwords and not ranking organically, there’s a lot of opportunity for them. What’s more, you also know for sure that they’re willing to invest in marketing. Want to know if a website is paying for AdWords ads? Paste their domain into Site Explorer. Then go to Paid search > PPC keywords. 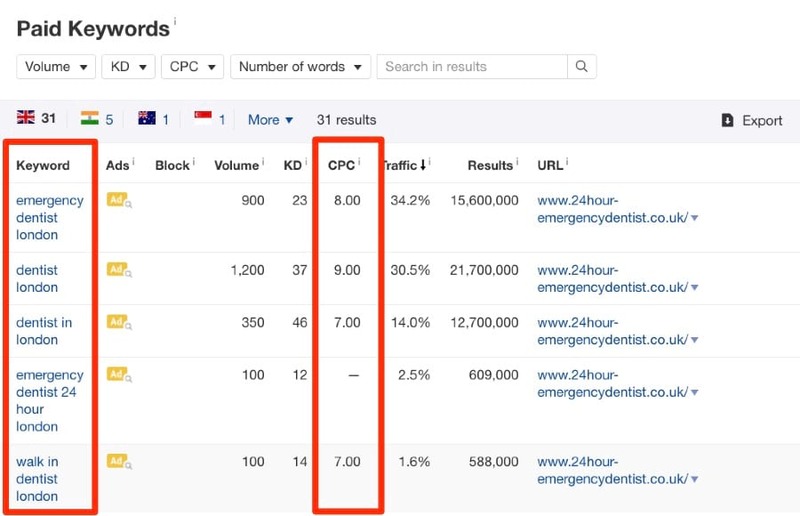 This will show you the keywords they’re bidding on, along with the CPC of those keywords. Where else do businesses advertise in your niche? Your aim should be to end this section with a spreadsheet packed with leads. If you don’t have this, don’t continue. You NEED a list of highly‐targeted prospects before proceeding to the next section. I will NEVER write “greetings of the glorious day” in an email. Look, every person reading this has probably received spam emails from SEO agencies before. I came across your website today when searching for “Roofing in London,” and noticed that you don’t show up in the maps section and are #33 in the organic listings. That’s a lot of calls you’re missing out on. Are you the right person to send this video? If you are, please reply to this email, and I’ll send it over. Otherwise, just let me know. First things first, always make an effort to find the owners name when emailing them. But that’s only the start of the personalization process. This data is personalized for each prospect (after all, nobody else can be #33 in organic search…only this guy!). If you can personalize that even further, then please do that. Do you want a drill? Or do you want a hole? Or maybe you would like to mount your TV on the wall? Businesses do not care about rankings. Nor backlinks. Corporate companies may care more about charts and graphs to show their bosses, but the type of businesses we’re targeting care about money. They want to increase their bottom line. This email is not intended to sell your services. It’s purpose is to pluck out the interested prospects. That’s it. As only a small minority will actually request the video, we can save ourselves the effort and record it AFTER they’ve asked for it. So, we record the video, add it to a custom page on our site, and send it over. Again, just to reiterate, we only record a video once we receive a positive reply. There’s no point wasting time recording videos for people who don’t want them. Notice I’m keeping it simple here. Then I upload that to Vimeo or YouTube and add it to a landing page like example.com/their-company-name/. And that’s it. Send that over to them and see if you get a response. The sad truth is many people won’t respond to your cold emails. That’s why persistence was the third item mentioned at the beginning of this article. If you don’t follow up, you’re throwing away opportunities. If you don’t receive responses to any of these emails, please don’t give up. I regularly forget to respond to emails. Ask Tim, who I forgot to email back after inviting me to write this guest post. There are numerous ways to follow up. My advice? Keep it simple. And don’t try to be fancy. A lot of the time, you’ll find that people have merely missed or forgot to respond to your email. And then summarise the email again below that. Super simple, that’s your bread and butter follow up for getting more responses. You’ll want to automate this though to save you some time. There are a number of tools that will plug directly into Gmail allowing you to follow up with your prospects automatically. You create a CSV or Google sheet with all the people you want to contact and their details for personalizing the email. Next, you’ll import these into your tool of choice. And within these tools, you’ll set an initial message and as many follow‐ups as you’d like to go out, at set intervals, e.g., three days after, six days after, and ten days after. If they don’t respond, these follow‐ups will send automatically. If they do reply, the follow‐up sequence gets stopped so you can manually respond without it interfering. This will allow you to be significantly more efficient. 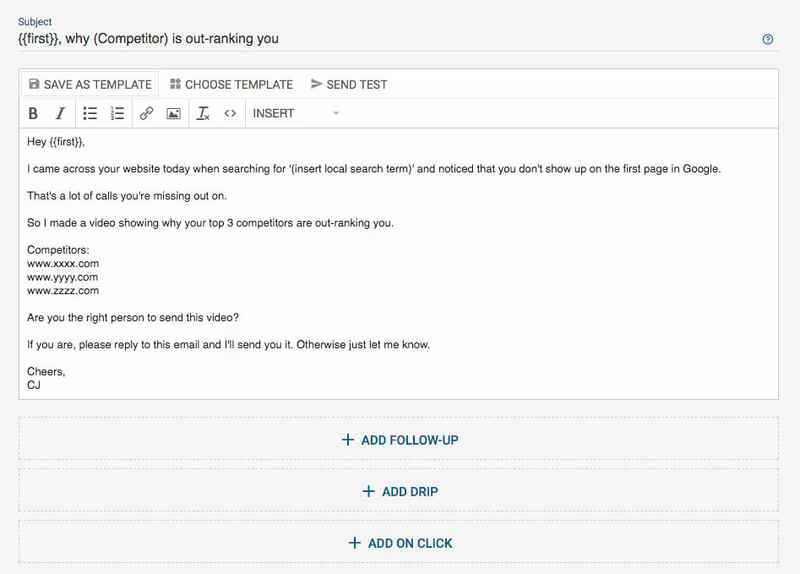 And with tools like Mailshake (shown below), it doesn’t prevent you from highly personalizing each email. Now if you’re sending these emails out daily and persisting with the follow‐up, sooner or later, someone’s going to take you up on your offer and schedule a call. But how do you then turn such SEO leads into clients? The purpose of the first call is to qualify them as a potential client. For the prospect, I call this a strategy session. I’ll share some ideas with them and run them through Ahrefs data to pique their interest, etc. But ultimately, my goal is to learn more about how I can help them, and qualify them to see if they’re a good fit for my services. It’s a standard consultative sales approach. How many new clients can you take on per month? What is your average client worth to you over a lifetime? What would your ideal result be from working together over the next 12 months? They don’t know me. They don’t like me (nor necessarily dislike me). And they sure as heck don’t trust me. I’m going to build all that up by asking great questions and figuring out what they want. Why are they speaking to me about their bad knee now? Why not two months ago when it started? What’s changed now? How is that impacting their life today? What aren’t they able to do? What does it feel like to walk on it? Run on it? What is the first thing they would do if their leg was normal again? What would their life be like 12 months from now if they could fix it today? Notice I’m not trying to sell the drill here. I’m talking about the hole, why they need it, what their plans for it are, etc. Are they a good fit for my services or not? Sell them what they want. Do they want to hire additional people to free up their personal time? Or get more consistent sales? Figure out what it is they want, and if you can deliver it with your services, “sell” them that. Not page one rankings. Just remember when I say “sell”, I’m talking about a free plan (aka proposal). If not, refer them to someone that can. Or give them some free advice and let them go. It’s a big mistake to talk to someone once, create a proposal, and email it to them. We’ve worked so hard to get them comfortable with speaking to us over the phone, let’s not backtrack on that. For the proposal, I deliver it using a service like join.me and a phone. Or you can use Skype if you’re based abroad like me. And all I’ll do is create a standardized presentation, similar to a webinar, where I walk them through step‐by‐step on what they need to do, and then offer to do it for them. I’ll introduce them to on‐page factors and compare their on‐page to their competitors. I’ll show them their backlinks, their competitors’ backlinks, and walk them through the importance of links. I want them to see that there’s a strategy, a science, behind what we do. If I can walk through said strategy in this level of detail, then it’s clear that I know what I’m talking about. So I’ll spend maybe 30–40 minutes walking them through this presentation. Then we get to the packages. After showing them the package and price I’m recommending to them, I use a soft, simple close. You don’t have to be pushy for this to work. I started out shy and awkward, and accidentally stumbled into this method because it was the only process I could get to work for me. Whether or not you close this client on this call, the process just repeats over and over. Follow up again with them. 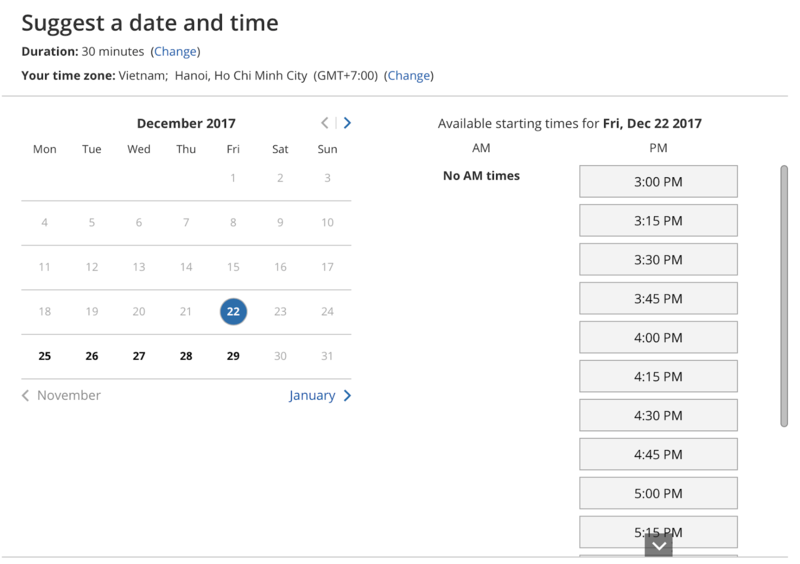 Schedule in another call for when they’re ready. Keep in touch by email and SMS. 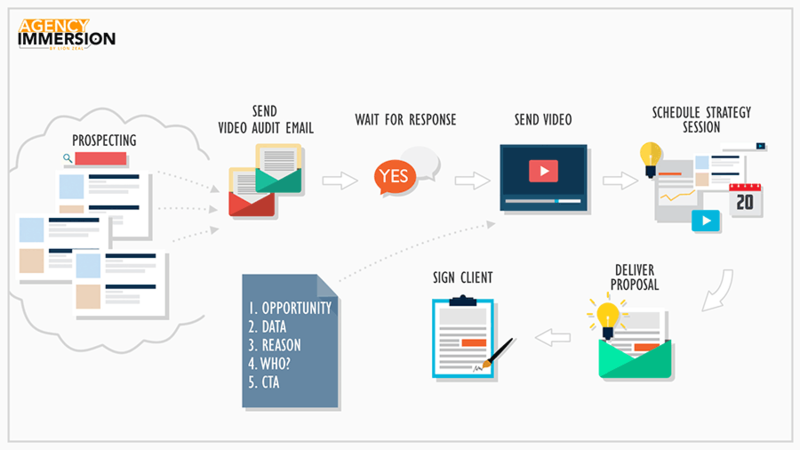 Continue emailing other businesses with the video audit offer. I recommend doing this every day. And just keep repeating it. This process won’t work if you give up after ten emails. Nor a hundred. It’s slow, time‐consuming, but if you master it, you’ll have the ability to acquire clients on demand. No waiting around for magic to happen.